In 2016, Treefort Music Festival held 'Filmfort’ in combination with Idaho Virtual Reality Council (IVRC). There, a speaker from ‘Women in VR’ presented research showing how VR increases empathy towards humanity when put “in the shoes” of the homeless. I immediately recognized VR as a powerful communication, educational and entertainment tool. And extended this idea to use VR as a medium to increase empathy or concern for the marine environment. I am interested in how VR can change people’s perspective of marine landscapes. My project aims to allow viewers to observe and reflect on changes that have occurred within the last 45 years by linking present day 360 footage of Lighthouse Reef, Belize to 1970 Jacques Cousteau footage of the same reef. Potentially, a person will feel closer to this environment and therefore become more connected to nature. Thus, through an immersive experience, VR may increase awareness and connection for the marine environment. As I am originally from Boise, Idaho, when living inland it is hard to reconcile how we possibly could impact the coast. Consumption of seafood, disposable items, along with industrial and agricultural run-off are a few areas inner continental policy decisions could mitigate and improve ocean health. With this project, I hope to connect people with the marine environment that seems far away. VR allows an experience that many are unable to practice due to fear of water or the expensive cost of diving. People, like Idahoans, can stay local, while experiencing a global tour of a changing reef. This project is a part of my Master’s degree and the research will help determine which factors of VR narrative are most influential in creating concern. This immersive experience has potential to drive local communities and government agencies to allocate funding to mitigate pollution, improve monitoring of resources, and incentivize renewable energy practices. In addition, an increasing number of cause-driven organizations are turning to VR to promote empathy. 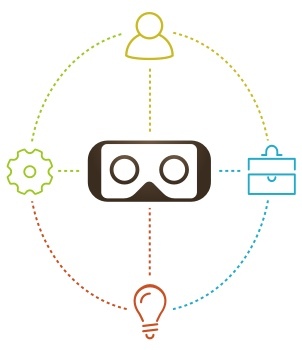 Others can then decide on how to more powerfully and effectively reach audiences with VR. Underwater 360 filming, while exciting, brought many challenges, some were abated still others arose nonetheless. First, there was the question of which rig to use. After weeks of deliberation I purchased the Kolar Abyss from Freedom360. Next, the logistical diving complications such as hampered communication, shortened timeframes, variable visibility, and of course, risk of flooding were issues we could plan for but realistically, hope for the best. We carried back-up equipment, to help mitigate foreseen obstacles since we were diving far off the Belizean coast. This included extra battery packs, hard drive space, and USB ports to minimize download times between dives. Still, batteries overheated and water splashed on our ‘water-resistant’ Gopro remote, which ceased our filming process. As the remote sat in a bowl of rice, our dive guide, Alison, offered her extra remote she miraculously had. It was unbelievable to find a spare Hero4 remote on this small atoll, inhabitancy six, 55 miles by boat to the closest store. We were in luck, this allowed the project and beautiful reef encounters to continue. To find out more about Brianna's project or to support her Kickstarter campaign, please select the photo or link below.